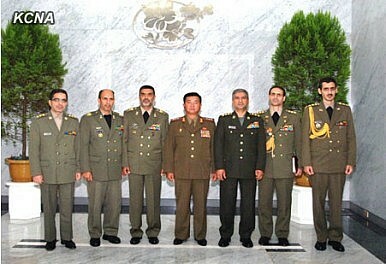 North Korean media is reporting that, on Thursday, Minister of North Korea’s Armed Forces Col. Gen. Jang Jong Nam met with an Iranian military delegation that was in in town to commemorate the 60-year anniversary of the armistice that ended active fighting in the Korean War. The report says that the Iranian military delegation was led by Sayed Hamidreza Tabatabaei, Deputy Commander of the Armed Forces of the Islamic Republic of Iran. Up until very recently Tabatabaei was a Parliamentarian who served as vice-chairman of the Judiciary Committee. Furthermore, when Iran’s media reported on the trip a week ago, it said that the Iran-North Korea Parliamentary Group would be visiting Pyongyang. Finally, Kim Yong-Nam, the Chairman of the North Korean Supreme People's Assembly (SPA) will reportedly lead the North Korean delegation who will attend Iran’s president-elect, Hassan Rouhani’s swearing in next week. Thus, it seems that North Korea is misreporting who the delegation really is. Then again, there's that KCNA picture above that suggests differently. Also on Thursday, Japanese Prime Minister Shinzo Abe began a three-day trip to Southeast Asia. In his third trip to the region since reassuming the Premiership, Abe will visit Malaysia, Singapore and the Philippines. “I hope I can take in the energy of the ASEAN region to achieve the economic recovery of Japan,” The Japan Times quoted Abe as saying before he leaving the airport. In Singapore, Abe’s path seems to have crossed with U.S. Vice President Joe Biden, whose wrapping up a weeklong trip to India and Singapore. Australia’s Foreign Minister, Bob Carr began a 10-day trip to China on Thursday. “Mr. Carr will have a series of high-level meetings in China, including in Hong Kong, Sichuan, Chongqing and Fujian,” China’s People’s Online Daily reported. According to Radio Free Europe/Radio Liberty, Russian and Iranian media outlets are reporting that Russian President Vladimir Putin intends to visit Iran in mid-August to meet with incoming President Hassan Rouhani, who takes office on August 3. Their talks will reportedly focus on solving Iran’s standoff with the international community over its nuclear program. Some believe the S-300 air defense system Russia was supposed to sell Iran may be discussed as well. It’s possible that Putin will be the first head-of-state Rouhani hosts after his inauguration. Outgoing Iranian President Mahmoud Ahmadinejad met with Putin at the beginning of this month when he was in Russia for a forum of gas-exporting nations. The U.S. and South Korea failed to bridge the gap on funding the U.S. Forces-Korea for 2013-2017 during two days of meetings in Seoul this week. They may meet again next month, according to Yonhap News Agency.